Coming from Maine’s arctic northern climes, I know many of my friends would be immensely happy to shed their layers of flannel and down to bask in the heat and humidity of Fort Lauderdale. Not me. I was looking forward to a Florida winter which feels like New England’s September – cooler evenings, clear, bright sunny days. Even locals were walking around asking the redundant “Hot enough for you?”. During Christmas, it was jungle hot. People who wore traditional holiday outfit melted like snowmen in a sauna. Rumors circulated by local weatherman said the weekend would be cooler, but a quick 7 mile jaunt on Saturday left me completely soaked after the first mile. What I am saying is, if you are not used to running in the heat make sure you do some training where you simulate the hot, oppressive conditions. Run with extra layers. Move the treadmill into the steam room. Spend weekends doing your long runs at the equator. I chose the Fort Lauderdale A1A Marathon as my first marathon because it feels like a home court advantage. I lived in Fort Lauderdale on and off for 8 years and I have run and biked most of this route multiple times. I still have friends and family who live in the area. Starting my trek in the New Year allowed me to spend the holidays with my sister and her beautiful family as well as my dad and his wife (because grandparents go where the babies are – amIright?) If I wasn’t going to do my first marathon in my Maine backyard, Fort Lauderdale is the next best thing. This is my review of the course only. This marathon has so much more going for it than the course itself. Fort Lauderdale is a fantastic vacation destination especially in the winter months. This is a well supported race, lots of volunteers, terrific community support, and the number one ranked racing medal with a locket built into the medal. Of course, I enjoyed running the beach. Hugh Taylor Birch State Park was a great break, especially as I ran the park near the end of the Marathon since the it wasn’t open when I initially would have passed through. 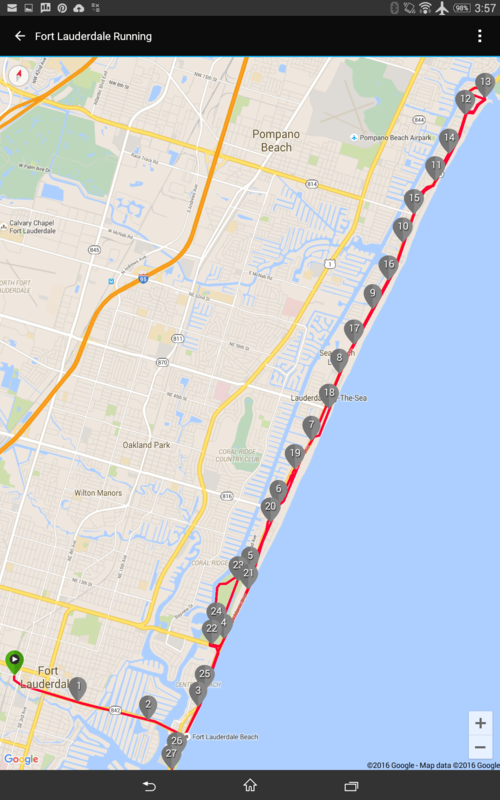 However, the 11 miles along A1A is gruelingly boring. The road is great. If you are running on the sidewalk, the sidewalk is great. Once you leave the Fort Lauderdale Beach, it’s tough to to see the ocean. You get a little time when passing by massive construction sites (which will eventually be skyscraping resorts which block the view), a little burst as you cruise by Lauderdale-By-The-Sea, and a soupchon of sea view as you enter Pompano Beach. Otherwise, you are running by motels on the west side of the road, hotels on the east, mall Plaza sprawl that mostly all looks the same, and a sprinkling of classic Floridian tourist trap spots, sadly fading into the past. It just seems so cruel to be so close to the beach, and yet so far. If you ever feel like a racecar when you are running, that part of the course might attract you, but at my horse and buggy pace this part of the course felt like watching Amish paint dry. There are all kinds of course design, many of which do not create a perfect loop. On courses where I’m not running the official race, I need to dedicate much more research into getting back to my car from the finish line. There is a possibility of hosts helping out or perhaps a volunteer from a local running group. Certainly relying on taxis could end up costing a good dealnmore than I expected. When looking at parking options, I need to be aware of maximum times allocated to the parking space. As I went to park on the morning of the marathon, I read the parking meter in detail only to find that there was a maximum 6 hour limit. At 5 a.m. in the morning, my choices became limited. Fortunately, I did not receive a ticket this time. Lesson learned. Although I have tried a number of tools for hydration, I was not prepared for the building heat that started to shut me down. I had plenty to drink and lots of electrolyte replacement, but I started to feel my body temperature rise around mile 19. Luckily, there is Publix right alongside the route, so I stopped in, bought a refrigerated bottle of water and walked around the cooler section for about five minutes. It didn’t help that I had a chest cold during the run. It made it difficult to breath and probably caused my body to work harder while fighting the infection. My concern is with marathons I’ll be running this summer. I will need to start training my body to deal better with the heat. I already have friends and supporters offering to assist me on the trail and others are sure to join. I need to make sure that when I am driving the course, I am looking for places where volunteers can safely cheer or replenish my liquids. I can’t expect them to interpret race maps the same way I do. They certainly won’t know where I need to make changes in the course due to construction or areas that are off limits. I need to have information that is clear and helpful. I am feeling great! Chaffing is healing quickly. During the run, I experienced some discomfort in my left ankle and right knee. After the race, my back was sore from losing my form in the burning sun. However, after a nice cold shower, some ibuprofen, and a good night’s rest, my body is feeling ready to do this again next week. Hopefully the cooler air and the elimination of this chest cold will help make this next marathon a better experience. Great way to present the run! Loved reading your story! Thanks Alex. I appreciate your support.